Square kilometre (International spelling as used by the International Bureau of Weights and Measures) or square kilometer (American spelling), symbol km2, is a multiple of the square metre, the SI unit of area or surface area. The symbol "km2" means (km)2, square kilometre or kilometre squared and not k(m2), kilo–square metre. For example, 3 km2 is equal to 3×(1,000m)2 = 3,000,000 m2, not 3,000 m2. Part of an Ordnance Survey map, published 1952. The grid lines are at one kilometre intervals giving each square an area of one square kilometre. The map shows that the area of the island is about two square kilometres. 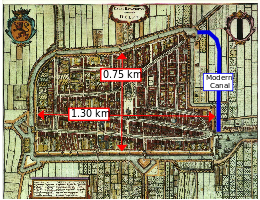 The medieval city of Brugge, a major centre in Flanders, was roughly oval or elliptical in shape with the longer or semi-major axis running north and south. Sydney Olympic Park, Sydney, Australia, contains 6.63 square kilometres of wetlands and waterways. The Old City of Jerusalem is almost 1 square kilometre in area. Milton Science Park, Oxfordshire, UK. Île aux Cerfs Island, near the east coast of Mauritius. ^ Assume that each hole requires (6000÷18 + 40) = 373 metres in length. The area needed is (18 × 373 × 120 ÷ 10,000) = 80.64 ha (1 hectare = 10,000 square metres). ^ There are 0.386102159 international square miles in a square kilometer while there are 0.386100614 US Survey square miles in the same measure. This is because the US Survey measures are very slightly larger than the international measures. "UnitConversion.org Area Converter". web page. UnitConversion.org. 2009. Retrieved 4 July 2012. ^ There are 247.105381467 international acres in a square kilometre while there are only 247.104393047 of the very slightly larger US Survey acres. "UnitConversion.org Area Converter". web page. UnitConversion.org. 2009. Retrieved 4 July 2012. ^ An International square mile equals 2.58998811|km2 while the slightly larger US Survey square mile equals 2.58999847|km2. "UnitConversion.org Area Converter". web page. UnitConversion.org. 2009. Retrieved 4 July 2012. ^ 1 acre (International) = 0.004046856km2 while 1 acre (US Survey) = 0.004046873km2 "UnitConversion.org Area Converter". web page. UnitConversion.org. 2009. Retrieved 13 June 2012. ^ "Medway Council Riverside Country Park". web page. Medway Council. 2012. Archived from the original on 19 April 2012. Retrieved 9 June 2012. ^ "Ashfield Brierley Forest Park". web page. Ashfield District Council. 2012. Archived from the original on 8 November 2012. Retrieved 9 June 2012. ^ "A History of Kiest Park". web page. Friends of Oak Cliff Parks. 2010. Archived from the original on 5 June 2012. Retrieved 9 June 2012. ^ "Golf Course Safety" (PDF). Crafter + Mogford, golf course architects. Retrieved 5 October 2012. ^ a b "Visitor Information [Manchester Golf Club]". web page. Manchester Golf Club Ltd. Archived from the original on 25 May 2012. Retrieved 11 June 2012. ^ "Welcome to the Trophy Club". web page. The Trophy Club. Retrieved 11 June 2012. ^ "Arabian Ranches Golf Club". 7 Days in Dubai. Catchpole Communications FZ-LLC, Al Sidra Media LLC. Archived from the original on 2012-09-08. Retrieved 1 April 2018. ^ "Sharm el Sheikh Golf Courses: Sharm el Sheikh, South Sinai, Egypt". web page. TravelSmart Ltd: World Guides. Retrieved 11 June 2012. ^ "Belmont Golf Club, Lake Macquarie, History". web page. Belmont Golf Club. Retrieved 11 June 2012. ^ "Jerusalem - The Old City". web page. The American-Israeli Cooperative Enterprise. 2012. Retrieved 6 July 2012. Actually, about 89 hectares. ^ "Science Vale UK". web page. Abbey House. Retrieved 7 July 2012. ^ "Invest in Poland". web page. Polish information and foreign investment agency. Retrieved 7 July 2012. ^ "Guildford Grammar School". waterhall.com.au. Archived from the original on 10 April 2013. Retrieved 2 April 2018. ^ "39th National Conference on Fluid Mechanics and Fluid Power". web page. Department of Mechanical Engineering, Sardar Vallabhbhai National Institute of Technology (SVNIT). Archived from the original on 19 July 2012. Retrieved 7 July 2012. ^ "MauritiusAttraction". Amity Institute of Higher Education, Mauritius. Amity Institute of Higher Education. 2011. Archived from the original on 12 October 2013. Retrieved 27 June 2013. ^ "Peng Chau<Leisure Line - Barrier-Free Information Website - Hong Kong Federation of Handicapped Youth". e-cgo.org.hk. This page was last edited on 12 November 2018, at 03:33 (UTC).